Buying a luxury handbag is without a doubt one of the most exciting fashion accomplishments. Besides being exceptionally stylish, luxury handbags are also strong and durable and will serve you for years before starting to show signs of getting old. These bags are also designed to provide adequate space and enhance ease of packing your stuff. Ever since its establishment Louis Vuitton has been a key player in the luxury backpacks scene. The French fashion giant has released several adorable men’s backpacks that have been received quite well in various parts of the world. While most of the Louis Vuitton Men’s backpacks have been exceptional masterpieces, a few have transcended the others in terms of style, quality and popularity in the market. The LV Michael Backpack is an exceptionally designed backpack that epitomizes beauty and functionality bundled into a single backpack. The stylish backpack is made of the unique damier gray check canvas, the Louis Vuitton signature. The bag is built for comfort and features a smooth black-colored leather trim to ensure this. It is practical bag with several nifty features. Its front has two zippered compartments that allows you to safely keep your items that you may need in the course of your travel. There is also a stylish front zip pocket. The adjustable straps are designed to make it both easy and comfortable to carry and are made of fine quality nylon material. Security is another feature of the backpack that makes it an impeccable product. It is a double zippered bag, a feature that protects your items and doubles up for convenience. It also comes with a D-ring for clipping keys. The polished sliver wrap that surrounds the zipper further enhance the beauty of the backpack. When opened, it reveals a stylish and durable black fabric interior that is complete with a pocket. The versatile backpack is a versatile piece that can be essentially used for both business and leisure. The backpack is built for comfort, style and durability and is amazingly light. Whether you need to carry a laptop, books or any other essentials, this is certainly the backpack to consider. The Christopher PM from Louis Vuitton is a popular option for many. 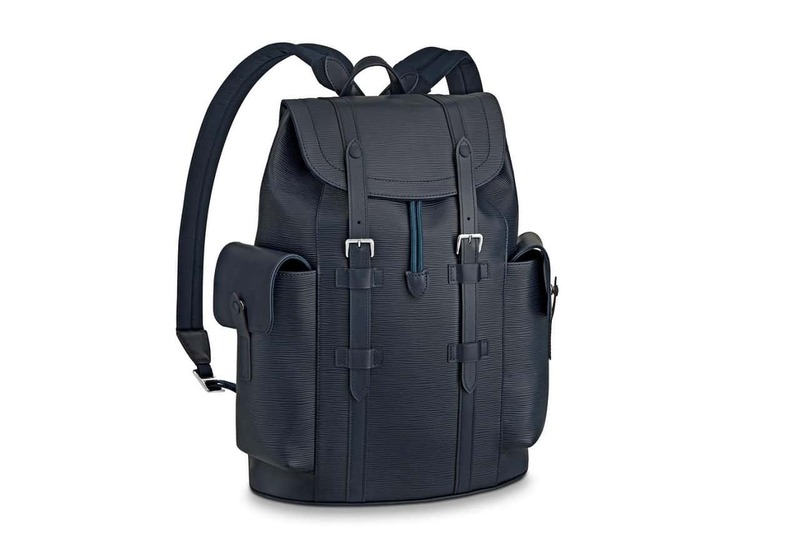 The backpack was designed for men on the go with an exquisite sense of style. It is a highly versatile bag that one can carry for any occasion. Whether you are traveling for pleasure or headed for a serious business meeting, The Christopher is sure to meet you requirements. The stylish backpack is uniquely refined and features a plethora of practical features. It is essentially built for everyday use and is made of fine quality material to not only ensure the stylishness, but to guarantee durability as well. Its sleek modern shape makes it stand out from other backpacks making it the ideal backpack to highlight your taste. It features silver tone pieces and a cow hide trim. The spacious interior has been especially designed to let you comfortably fit in your items while the large zippered side pockets provide you with safe storage for your delicate documents. The backpack is also available in a variety of colors ranging from blue to noir to maroon through red and khaki among others. Its prints are epi leather, classic monogram, Macassar and Damier graphite. The quality of material used in the production of the Palk is remarkable. The bag blends the traditional unique touch of Louis Vuitton with a sleek modern shape for a gorgeous backpack. It is a well-refined piece that looks amazing for any occasion. It is the perfect accessory given its varied uses. The Palk will suit your needs for both business trips and leisure outings. You are also likely to fall in love with the level of comfort this backpack delivers. Its straps are made of a strong albeit soft material. They are also adjustable to allow a wearer adjust it to a size that is comfortable for their preferences. The interior of the Louis Vuitton is neatly arranged with compartments well-organized for easy packing. It is also rather roomy to allow you keep a lot of items without stretching it. The classic monogram canvas is used on the exterior of the backpack. It is crafted from black cowhide trim and high-quality silver metallic hardware. To protect your essentials, the backpack comes with a leather flap that descends into a classic buckle closure. A soft burgundy textile lining is used for the interior of this incredible backpack. There is a laptop compartment that is lined with foam. You therefore do not need to worry about the condition of your delicate items even if the backpack should take a fall. If you are looking for a sporty and detailed backpack, then the LV Palm Spring is definitely the product to look out for. It is a classic backpack that has been designed for style and comfort. It is an urban-style masterpiece that will elegantly complete your outfit. While investing the beauty of the backpack, Louis Vuitton has also ensured exceptional functionality. One of the features that makes it a one of a kind product is its lightweight. The loose soft canvas that is that is used on its exterior is responsible for its characteristic light weight. To further enhance the beauty of the exterior, the backpack features a calf skin trim as well as gold-toned hardware that don it. The backpack also has engraved zipper pulls. Other interesting features of the backpack are the sturdy adjustable straps. There is also a leather scarf loop attached to it. Convenience is also a noteworthy feature of this product. It has a spacious exterior pocket that helps keep your items safe and easy to access. The interior is designed to keep things secure. It is lined with a nylon fabric that has a flat pocket attached to it.